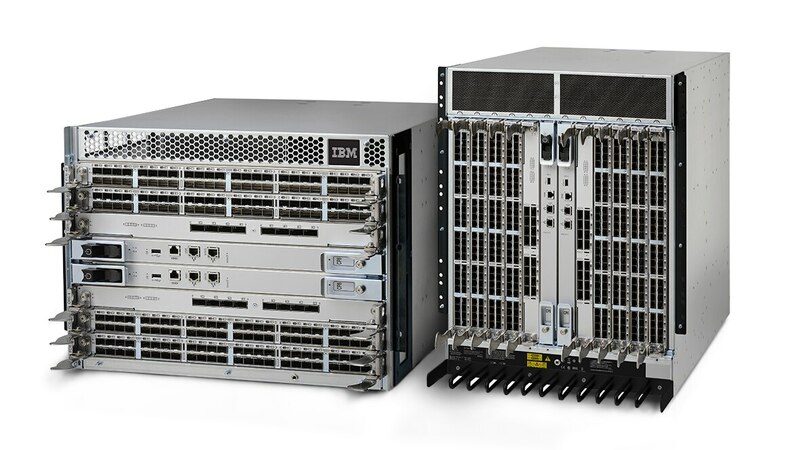 IBM® System Storage® SAN768B-2 and System Storage SAN384B-2 fabric backbones are Fibre Channel switching infrastructure offerings that provide the foundation for reliable, scalable, high-performance storage. These fabric backbones also offer enterprise connectivity options for IBM FICON® connectivity, delivering a high-performing and reliable FICON infrastructure with IBM z Systems™ servers. The System Storage SAN b-type family switch leverages Gen 5 Fibre Channel and Fabric Vision technology to deliver long-term solutions for mission-critical applications that require secure, high-performance, low-latency storage networks. Address key SAN infrastructure consolidation requirements using Gen 5 Fibre Channel technology to minimize downtime and disruption no matter the size of your business. Industry-leading Gen 5 Fibre Channel technology delivers 16 Gbps line-speed performance and up to 10.2 Tbps chassis bandwidth to address demanding I/O requirements. Innovative monitoring, management and diagnostic capabilities help your administrators avoid problems before they impact operations so you can meet SLAs. These fabric backbones help you unleash the full potential of high-density server virtualization, cloud architectures and next-generation storage without sacrificing your existing IT investments.